Opening hours: The 2.30 to 5pm siesta is widely observed; most shops are closed on Sunday, and some do not open on Saturday evenings. More often than not used as a transit base or intermediate point between destinations elsewhere on the mainland and the magnificent Cies Islands, Vigo is worth a look around much more than it customarily receives credit for. With art museums, some of the world's finest seafood, breezy seaside promenades and an attractive old town, Vigo is worth lingering in for quite a while. Vigo's Castro archaeological site grants visitors a glimpse into what the Galician settlement of today once was (between roughly 2 BC and 3 AD). Guided tours of the Castro are organized Tuesday to Sunday, 10am-2pm & 4-6pm. Hike up the mountainside to take in the ancient city from afar. 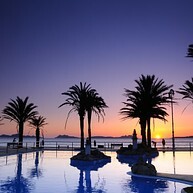 The Cíes Islands, just off the coast of Vigo, are home to one of the world's finest beaches (Rodas Beach), and are easily accessible by sea. Only 2,200 visitors per day are allowed on the islands, so do reserve your spot in advance if traveling during high season or at the weekends. 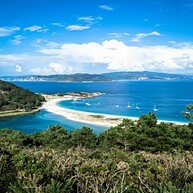 Samil Beach (or Praia de Samil) is, perhaps, the finest stretch of sand in the area, easily accessible from downtown Vigo. Only 5km away from the city centre and with opportunities for dining and relaxation (including open-air kids' pools and beach facilities), the beach is an excellent choice for a day trip. Make your uphill to Parque do Castro via Camelias Street - although the climb is somewhat steep, the views over the Vigo estuary from here are simply unbeatable. 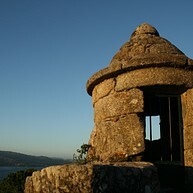 The Castro de Vigo (dating back to the 3rd century BC) and Castello the Castro can both be visited en route. Contained inside what was once built to become a public prison, the Vigo Museum of Contemporary Art is a local cultural center that boasts a regular rotation of exhibitions, showcasing various forms of artwork (from painting to modern design). There is no permanent exhibition, however, so do check what's on when you're in town. 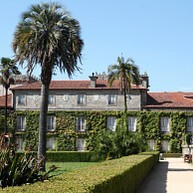 Housed inside a former castle, and with splendid park grounds in its immediate surroundings, the Quiñones de León Museum is worth the short trip from central Vigo if only for its well-maintained French garden (some say, a miniature copy of the one in Versailles). 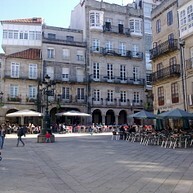 The museum itself contains archaeological artefacts discovered in Vigo and surroundings. 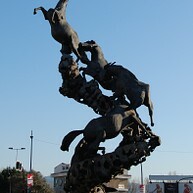 Juan José Oliveira's 1991 creation will quite probably strike you as one unlike any other you've ever seen - the ensemble of horses ascending to the skies up a waterfall reflects the thematic concerns of Oliveira, and was partially inspired by the wild horses historically inhabiting the region. 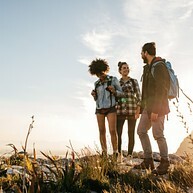 Hike up to the top of Monte da Guía to the towns northeast and take in the panoramic view of the city of Vigo and Ria de Vigo river, with the splendid Cies Islands looming in the background. There is a scenic little chapel at the hilltop. The hill is a half hour's walk from the Vigo Guixar station. A pleasant urban park within easy reach from downtown Vigo, with a kids' entertainment area, basketball courts, and an open-air amphitheatre (hosting world-renowned celebrity musicians a few times per year) on its grounds. Climb to the top and see what remains of the Castro.